Daily Bible study is a great goal for all of us. Every single day spending time in the Word, time with Jesus. 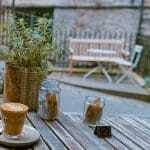 But finding the time, the best method, the right version, the prettiest journaling Bible or Instagram setting can make actually sitting down to invest in a daily Bible Reading plan a challenge. 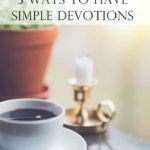 Simplifying our devotional time and taking the time even if life is busy is essential. 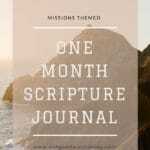 Finding ways to get more from our daily Bible study. 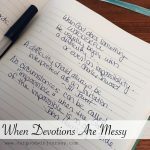 Sometimes devotions can be messy. Sometimes it can be really difficult to carve out time in the day to spend with God. Which means if I get that time, I want it to be everything it can be. I want to get out of God’s Word ALL that He has planned for me that day. 1} Pray. Before you read, ask God to teach you through His word. Ask the Holy Spirit to help you focus. 2} Underline. If something stands out, underline it! 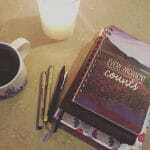 Rewrite the verse or phrase in a journal and think about it throughout the day. 3} Summarize. Rewrite what you read in a journal and put scripture in your own words. 4} Share. Ask God to direct you to something that you can share with someone else. 5} Praise. Give God praise during your reading for things He has done or promised in His word. 6} Decide. When you find something in God’s word that means change in your life, decide on a plan of action right away. 7} Read Aloud. Involve the sense of hearing. Put emphasis on important words. Or, use Biblegateway to read out load for you while you work! 8} Use the text. Pray what you read! Pray for family, situations, unsaved loved ones… use God’s Word as you pray to Him! 9} Focus. Take a break from reading large portions at a time and try focusing on one or two verses. 10} Return. When something stands out to you from God’s word, write down the reference and go back to it the next day. Allow God to do His work in your life by returning to scripture that means something to you in that moment. I wanted to share these things with you because I’m using them to fall more in love with God’s Word! Each one is precious and valuable when it pertains to digging into God’s Word and getting more from what we read in our daily Bible study. In my own words… It isn’t how long you spend in the word that is important, it is making sure you use God’s Word as a tool for growth and getting to know God more. 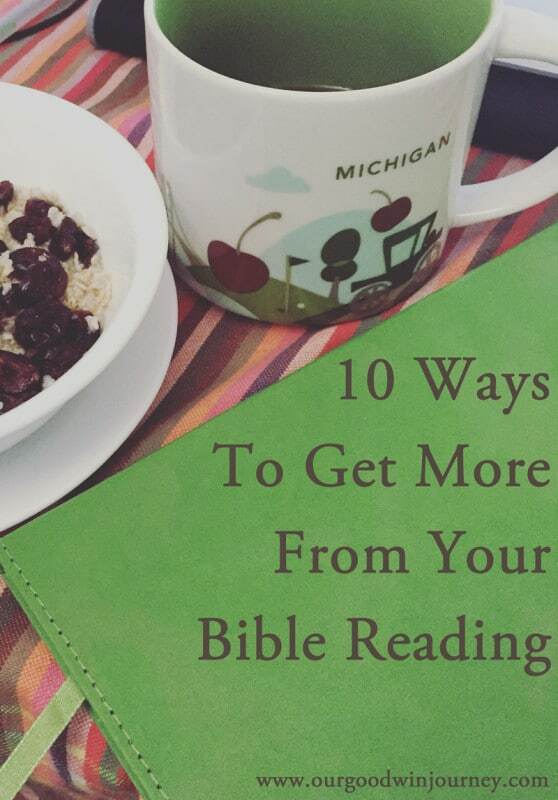 Making sure that daily Bible study is a key part of your day. One last thing, pray and ask God to increase your hunger for the word. It might not happen right away, but falling in love with the scripture is a rewarding journey! What are ways that you get more from Bible Reading? Do you have a tip to add? Also, have you ever dug back through those old prayer journals? I did and learned a few things. Great post it is very difficult to create a “normal” when in a foreign place. I love reading my Bible with my cup of coffee beside me. I have the very same cup to remind me of home. I love taking my mugs with me for the same reason! That hunger for His Word is exactly what I prayed for the other day before I saw your blog! Wow! Thanks for that list, and by the way I love the song you have on your site. As I’m on dial-up I’m hearing it chopped up but it reminded me to go listen to it again.